The simplest belay is the one the word originally meant. The sailor wraps rope around a cleat so that it cannot be pulled; the earliest climbers wrapped rope around or over a boulder or rock horn or the like, hoping for the same result. The only difference between this and tying the rope directly to an anchor was that the rope could be fed out or taken in without untying and retying a knot. Today, a firm grip on the rope, coupled with a sufficiently small protected fall, produces the same functional result—no rope is pulled through the belay. By definition, this is a static belay. In fact, most falls today are held by static belays. In a static belay we encounter the strangest truth in all of belay theory. 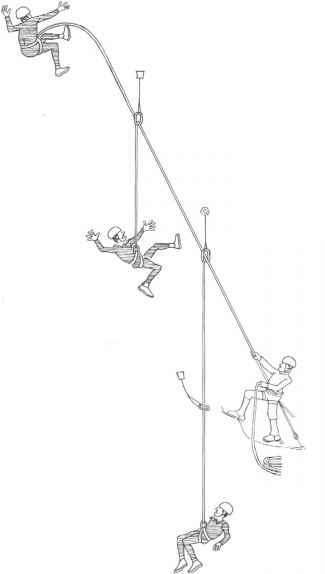 The forces are determined only by the distance of the fall, divided by the length of the rope between climber and belayer (see fig 7-24). This number is so important it has a name: the fall factor. It is a pure number, independent of the scale, such as feel, used to calculate it. Thus, for example, a 20-foot fall on 100 feet of rope has the same fall factor as a 2-foot fall on 10 feet of rope: 0.2. Both falls produce the same force in a static belay, if the climber's weight and the rope's characteristics are identical. If a climber falls before placing any protection, the fall factor is 2, the maximum possible. No matter whether the climber was just above the belayer, or if he was at the top of a 150-foot pitch on an ice face, the resultant forces are the same (neglecting friction on the rock and in the system, air resistance, etc.). The energy of the longer fall is absorbed by the proportionally longer rope. before breaking. The standard is administered by the Union Internationale des Associations d'AI-pinisme (UIAA). In order to pass this test, a rope must hold at least five such falls, spaced five minutes apart. 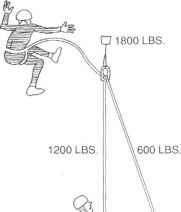 The maximum force on the protection must not exceed 2,700 pounds (1,800 pounds for a half rope) on the first fall. However, this is still basically a rope-strength test. 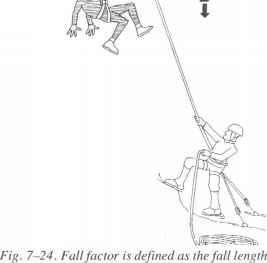 Because it uses a static belay and the extremely high fall factor of 1.7, it does not show the forces produced by real belays of typical falls. The only fall length tested is 16 feet long. If all belays were static, fall factor alone would determine the forces of a fall, and forces could be controlled quite simply. The rule would be: it is more important to place protection at the beginning of a pitch, than at the end. This is because a given fall produces the highest force early in the pitch, the lowest force at the top. Although it is still good to keep that rule in mind, the forces in a real fall are reduced by two other factors. They constitute the difference between the static belay of the sailor and the actual belay given by the climber. These are: movement of the belayer, and friction on the rope at the belay. We will introduce them in their historical context. The early climber's equivalent of a "cleat," a rock feature around which to belay a rope, was not always conveniently located near a placc to stand or sit. The belayer, therefore, often substituted his own body for the cleat. It was quickly realized that if the belayer moved under the force of the fall, the force was significantly reduced. Sometimes called the resilient belay, this had one problem: the greater the movement, the greater the chance of collapse and total failure. Some authorities encouraged belayer movement, others warned against it. It is not surprising that up to the middle of the twentieth century, the situation was summed up in the golden rule of climbing, "the leader must not fall." But world-famous climbers did in fact survive leader falls, which the theory of the day said should have broken their ropes. Some suspected that rope slip in the hands of their belayer played a role in saving their lives. But this was considered to be a partial loss of control of the rope, embarrassingly close to total failure of the belay. Its implications were seldom even discussed. The first real breakthrough in belaying was the full realization of the value of substituting a fric-tional grip on the rope for a static belay. When the rope was pulled through a belaycr's gloved hand, the climber decelerated slowly. The energy of the fall, instead of being absorbed in a small fraction of a second, was spread out and thereby reduced. The Sierra Club, in the 1930s and 1940s, demonstrated the value of the new dynamic belay theoretically, experimentally, and by putting it into actual practice. It was so successful that it allowed modern rock climbing to begin in Yosemite. The new golden rule became, "the rope must run." % INCREASE IN FALL DIST. 7-25. The trade-off in a dynamic belay and 32 feet from the belayer, the fall factor is 0.5. If rope slippage at the belay increases the fall 33 percent (5 feet), the force on the protection will be reduced by almost half. The benefit is greatest at high fall factors, which is also when rope slippage is most likely to occur. (This graph is based upon the current standard theory of belaying developed forty years ago by Wexler, which includes several simplifying assumptions, including simplifying the rope's characteristics and neglecting friction in the system and between the climber and the rock). Modern kernmantle ropes stretch so well that they removed the necessity for the beginner to learn dynamic belay theory and technique. The golden rule "the rope must run" passed into history. Indeed, kernmantle ropes are frequently called "dynamic ropes." But that does not mean a dynamic belay—rope slippage—never occurs; it means only that it is now very uncommon. 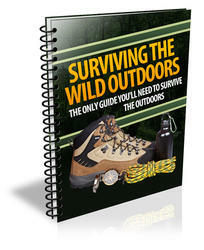 Rope slippage is still possible if the fall factor is high, or the belay friction is low. In either case, the pull on the rope exceeds the friction in the belay, so the rope slides. Fig. 7-26. Comparison of the major belay types method produces a certain tension in the rope between the climber and the protection, which can be calculated using the current standard theory. The result is a point in this graph. A series of falls at different fall factors produces a line in the graph. In other words, each line shows the force produced by a given type of belay, at different fall factors. The solid lines represent static belays wherein all of the energy is absorbed only by rope stretch. 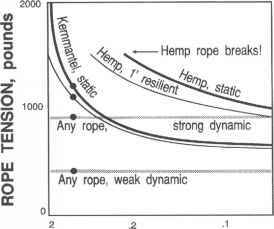 There are two lines, showing the great difference between modern kernmantle and early hemp ropes. The dashed lines show the effect of 1 foot of belayer movement, holding an 8-foot fall, with each rope. The two horizontal lines show the effect of dynamic belays with two different levels of friction. These levels are the highest and lowest friction that have been suggested by various authorities in the past twenty years. To illustrate, consider the previous example, whose fall factor was 0.5. If the belay is static, the peak tension is 1,200 pounds. If the belayer moves one foot during the fall, the tension is reduced by only 75 pounds. The "strong dynamic belay" in the graph reduces the force to 900 pounds, and the "weak" one reduces the force to 400 pounds. (The fall would be 2 and 12 feel longer, respectively). The same dynamic belays would, be definition, result in the same tensions in a hemp rope, regardless of fall factor. Of course, a static belay would break the hemp rope. In summary, the friction applied to the rope at the belay places the real practical upper limit on the forces that a fall can produce. In other words, rope slippage at the belay dissipates excessive force, just like a safety valve on a boiler dissipates excessive pressure. How the belay is chosen and applied determines the force at which the rope slips, just as how the valve is designed determines the pressure at which it opens. Let's look more closely at how the belayer's "safety valve" works. How is fall factor determined?